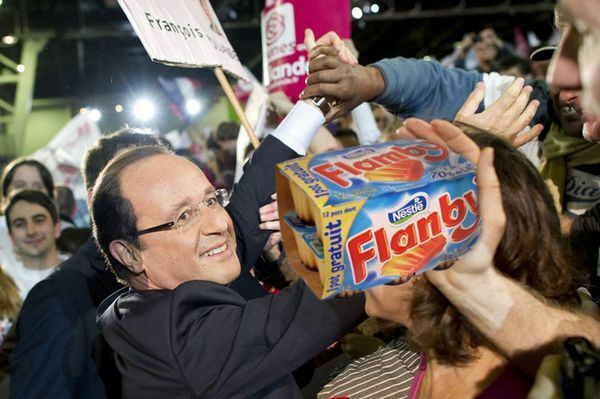 I’ve no idea what Hollande is going to be like (except that he’s certainly going to be disappointing). But I do know that this [Economist editorial] is one of the most exquisitely refined examples of globollocks that I’ve ever seen. It’s as beautifully resistant to the intellect as an Andropov era Pravda editorial. A few more years of this and the Economist won’t have to have any human editing at all. Even today, I imagine that someone with middling coding skills could patch together a passable Economist-editorial generator with a few days work. Mix in names of countries and people scraped from the political stories sections of Google News, with frequent exhortations for “Reform,” “toughminded reform,” “market-led reform,” “painful reform,” “change,” “serious change,” “rupture,” and 12-15 sentences worth of automagically generated word-salad content, and you’d be there. I wonder whether even the writer of this editorial would be able to define ‘reform’ or ‘change’ if he were asked, beyond appealing to some sort of ‘social protection bad, market good’ quasi-autonomic reflex embedded deep in his lizard brain. I also wonder whether the people in there are as cynical about their product as Andropov-era journalists were, or whether they actually believe the pabulum they dish out. This was precisely my reaction in reading The Economist’s broken-record admonishing of the French to “reform” their welfare state, to get themselves a Margaret Thatcher and, well, do what exactly? 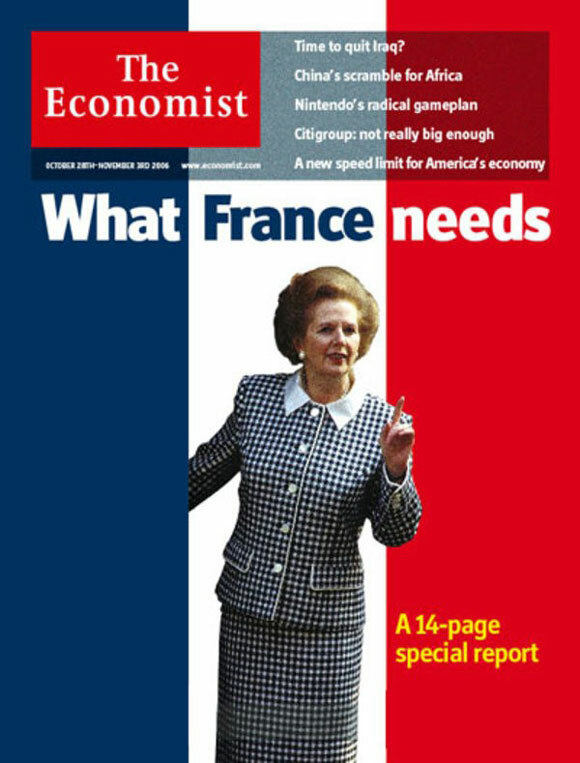 Imitate Mrs. Thatcher and her acolytes Blair and Cameron—both carrying The Economist’s AOC label—so the French can replicate the brilliant success of the British economy? Right. I am really quite fatigued with this neoliberal Anglo-Saxon finger-wagging at the French. Really, what are the French supposed to do? Privatize? It’s already been done (and thanks in no small part to directives from a European Union that neoliberal Anglo-Saxons claim to abhor). Raise the retirement age and reform pensions? That’s being done (and the left in power will not reverse the legislation of the past decade on this). Reform the Sécu? How so? Reduce the number of state functionaries? Okay, but in which categories? Cut spending? Okay, but please specify what and where. If anyone out there adheres to The Economist (or Wall Street Journal editorial page et al) line on all this, I invite him or her to state very specifically what the French should be doing, with precise, specific references to actual French legislation. If one is able to do this—and I’m not going to hold my breath on it—then s/he may spell out what s/he thinks the salutary effect would be, of how this would make France a better country. I’m not suggesting that there are not important reforms that need to be made—e.g. merging the régimes spéciaux into the general system—but I just want to hear it from the finger-wagging neoliberal Anglo-Saxons. If they can’t explicitly spell it out, then I will ask them to please STFU. ADDENDUM: One of the Anglo-Saxon finger-waggers is Walter Russell Mead, who has a bee in his bonnet about what he calls the “blue social model” and its supposed bankruptcy, figurative and literal. He liked The Economist editorial on Hollande (here). Okay, Mr. Mead, please tell us very specifically how you would reform France. Grande journée demain de défilés et rassemblements politiques, mais étant absent de Paris je vais malheureusement le louper. Big day for political marches and rallies in Paris tomorrow, but as I’m still outre-Atlantique I will unfortunately miss it. Si on va assister à une ou plus de ces manifestations faites-moi signe et je publierai vos observations et/ou commentaires (et même photos). If anyone is going to attend one or more of these demos, do let me know and I’ll post your observations and/or commentaries (and even pics). All Western social democratic parties have, over the past generation, made the transition from the factory floor to the faculty club. American Democrats and French Socialists have gone farthest, and now have scant support among the working classes they were built to represent. Intellectuals…can get excited about the fate of the Socialist party, but no one else can. Actually, not even intellectuals get too excited about the Socialists hors périodes électorales. As for working class support, there is a certain amount of nonsense in the conservative conventional wisdom on this. The US Democrats still have a working class base—albeit not at the same level as five decades ago—as do the French Socialists. The latter, in fact, lost a good part of its working class base to the Communists from the 1920s onward, though still had its bastions in the Nord and parts of the Midi. With the decline of the PCF in the 1980s, the FN became the n° 1 vote-getting party among ouvriers—at least in presidential elections—, with the PS following a close second. The syndrome is not new. In last Sunday’s vote, according to the IPSOS exit poll, Marine Le Pen came in first place among ouvriers, as could be expected, with 29%, followed by François Hollande at 27% (and with Nicolas Sarkozy a distant third at 19%). As for employés—which includes pink collar/clerical—, Hollande was first with 28%, followed by NS at 22 and MLP at 21. Among lower-income earners, the Socialists are still the n° 1 party. The Socialists are the party of les bobos—a word coined by David Brooks in The Weekly Standard as shorthand for “bourgeois bohemians” but which is now much more commonly heard in French. Professors, minorities, the mega-rich, single women, and government employees … these are the core of the coalition. It is arguably mightier in France than in the United States because the state is mightier. Government spending takes up 56 percent of GDP. Ouais, bof. This bobo-Socialist business has become the new cliché in French politics, and good for one-line zingers at right-wing rallies (Marine LP got in a few, and to a resounding chorus of boos, at the Zénith the week before last). But it is just that: a cliché. As for the “core of the [Socialist] coalition,” foutaise I say! Professors? They vote no more for the left nowadays than they ever have (and at the university level, more vote for the right in France than in the US). Minorities? If one is referring to those of Muslim Maghrebi origin, their désamour toward the PS is heartfelt. The Socialists have never gone out of their way to cultivate them as a community. Maghrebis in France in fact tend to dislike the Socialists, voting for them only to counter the right and its hard-line discourse on immigration. The parliamentary right could indeed have made inroads into the small and fragmented but growing Maghrebi electorate—playing on the De Gaulle heritage, conservative social values, and their désamour toward the Socialists—but clearly decided that there were more ducks to be hunted among voters in France who dislike those Maghrebis. The mega-rich? Huh? In France?? Are you serious, Monsieur Caldwell? Single women? As a “core of the coalition”? Sorry but no. Government employees? Mais bien sûr. No doubt about that one. Hollande’s platform is nugatory. Next to it, Bill Clinton’s 1996 “micro-initiatives” look like the Sermon on the Mount. This is true. 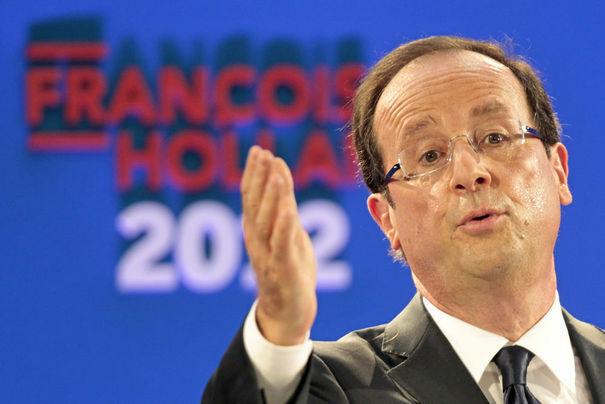 Policy-wise Hollande has proposed little of substance and for three reasons: 1. Anything interesting he could propose would cost money, which he won’t have, 2. Important reforms that he and the Socialists know they should propose will seriously alienate important components of the Socialist electorate, and 3. Hollande and the Socialists are not entirely sure what they stand for and in what direction they want to take the country. If Sarkozy hadn’t done himself in with his personality failings, disastrous style of politics and governing, and unprincipled opportunism, he would be a clear favorite for reelection. I’ll come back to this in the very near future. 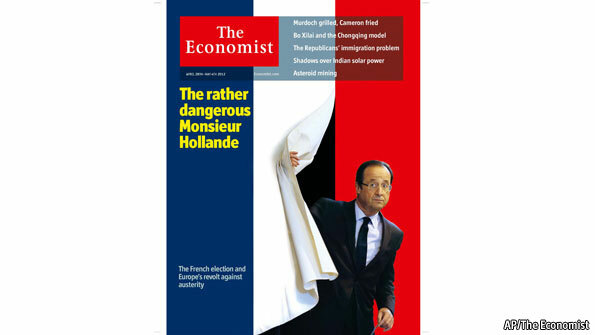 Economists (not to mention the Economist) think Hollande is going to be a catastrophe for Europe. They are probably wrong. Not because Hollande is wiser than he lets on but because markets have likely already priced this fiscal laxity into the euro and because Hollande’s policies are not as different from Sarko’s as they look. Good observation. 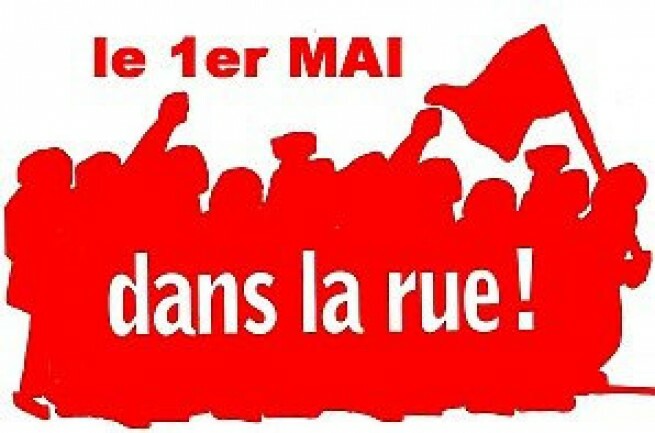 Mélenchon voters darkly suspect that Hollande will in fact pursue similar policies to Sarkozy. 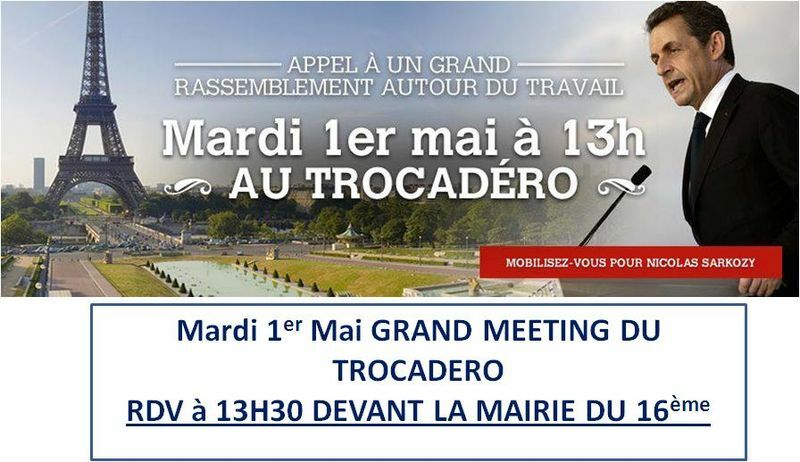 The May Day march of the syndicats on Tuesday will be a signal to Hollande that the left will have an eye on him, so I was informed by a cégétiste this weekend (via Skype). 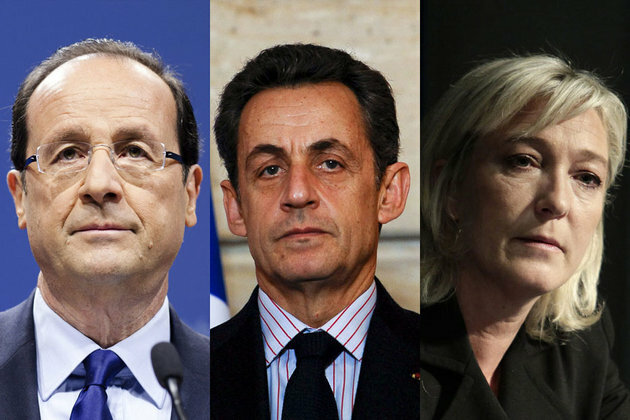 They are not likely to be pleased by decisions a Hollande presidency will take. Typical Anglo-Saxon Eurosceptic pablum and of which Caldwell and other US conservatives are fond. There has indeed been a democratic deficit in the construction of Europe and that no one would deny. The European Constitutional Treaty was designed to rectify that, but which the stupid French electorate rejected in ’05. Too bad for them. 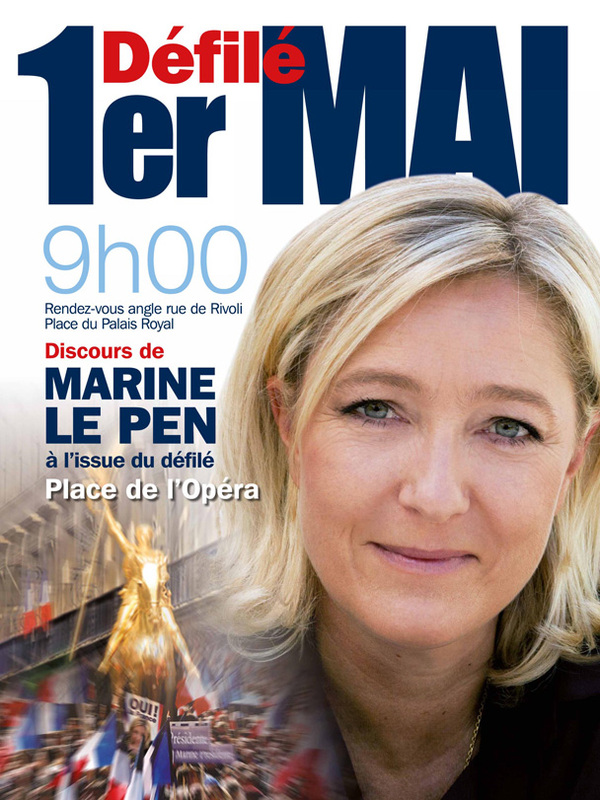 In fact, the major preoccupations of the National Front in recent years, and especially since the party was taken over by Marine Le Pen 18 months ago, have been the erosion of French democracy by the European Union and the erosion of the French economy by globalization (of which immigration is certainly an aspect). 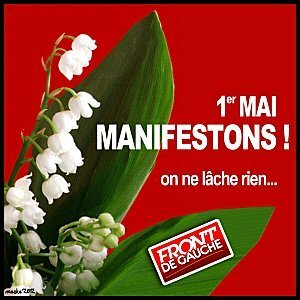 The FN is opposed to Europe for nationalistic, France-first reasons, not because it erodes French democracy. GMAB! But Le Pen and Mélenchon are not as different as that, and there is something we need to be conscious of. The extremists in olden times were extremists because they took the view that democracy was not up to the challenges of the day. Mélenchon and Le Pen, whether you like them or not, are calling for more democracy, not less. On this, Caldwell is completely, totally à côté de la plaque. My dim views on Jean-Luc Mélenchon are well-known to all who read this blog but there is really no comparing him to the Le Pens except for a penchant for trash talking and verbal violence against political opponents. If Mélenchon is calling for more democracy, I have failed to see it in his discourse. As I have explicated, democracy is not one of his core values. As for Marine LP, she has had nothing to say about the functioning of institutions except to call for the systematic recourse to referendums on just about every issue dear to the FN and with the possibility of citizen initiatives. Whether or not the tool of the referendum enhances democracy is a big question that I won’t get into here—national referendums are, of course, non-existent in the US and Germany and practically so in the UK—, except to say that historically speaking they have not been associated with democracy in France. Until the Fifth Republic referendums = plebiscites, and plebiscites = Bonapartism. In view of the FN’s ideological antecedents and its manifest predisposition toward strongman (or strongwoman) leaders, the recourse to the referendum/plebiscite were it to come to power could only be viewed with disquiet (not to mention the very idea of the FN exercising power). There is one concession that would drop most of the Front’s votes into the UMP’s lap. That would be an agreement to form alliances with FN candidates in the legislative elections that are scheduled for June. It won’t happen. Not a chance. More on this later. The upshot of this election’s first round is a likely victory in the short-term for the Socialists, but a larger long-term victory for the National Front. Sheer arithmetic is doing away with the cordon sanitaire, turning the FN into the natural political home for voters driven out of the two larger parties by an evolving economy. It may be turning the FN into the natural opposition party of France. I don’t think so. The chances of the FN replacing the UMP as the principal opposition party if the left comes to power are minimal. More on this later too. the anti-Sarkozy frenzy that has seized France in ways that make Bush Derangement Syndrome look like afternoon tea in an Edith Wharton novel. This is very true. E.g. I was a Bush hater from Day One, i.e. from the 2000 campaign onward, but felt that the even more virulent Bush hatred of liberal-lefties was over the top. It was too much, particularly during his second term. Likewise with Sarkozy. There are in fact excellent reasons to despise the S.O.B. and to desperately want his political career to end next week, but too many French lefties—as well as non-lefties—have become unhinged in their Sarko hatred. It has become less a political phenomenon than one of mass psychology. Again, a subject I will come back to before next Sunday. Mme Moutet knows that Sarkozy’s chances are slim next Sunday but “would love to see [her family’s] faces if Sarko pulls it off.” This sounds personal. All I can say is that if Sarko does indeed pull it off, I’ll put egg on my face. Literally. I promise. An apocalyptic cult. Or simply an extreme right-wing party. One thing’s for sure: if I had to choose between the current GOP and the French Front National of Marine Le Pen, I would take the latter without the slightest hesitation. The Republican party has really gotten that bad. That mismatch between parties and governing institutions is exacerbated by the fact that the polarization is asymmetric. 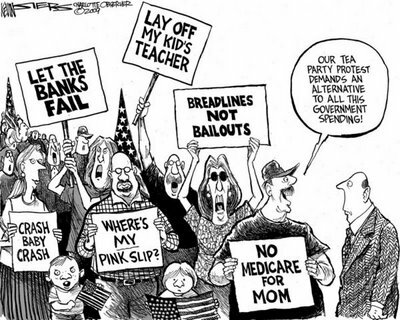 Republicans have become a radical insurgency—ideologically extreme, contemptuous of the inherited policy regime, scornful of compromise, unpersuaded by conventional understanding of facts, evidence, and science; and dismissive of the legitimacy of their political opposition. The evidence of this asymmetry is overwhelming. par l’action militante et syndicale, par l’éducation populaire, par la formation politique. Mais cela ne peut se faire que sur le temps long et dans un climat apaisé. Tout à fait. I will add to Art’s critique. One of main factors limiting Mélenchon’s appeal to the broad couches populaires—that put a ceiling on his potential vote—is the nature of his class base, which is heavily comprised of fonctionnaires in the professions intermédiaires and salaried, unionized employees in publicly owned enterprises (SNCF, EDF, La Poste, etc), or those that were in the nationalized sector until the wave of privatizations of the past two decades (and where the CGT and other syndicats are still present in force). This is the aristocracy of the working class in the semi protected sector of the economy—with its special pension regimes, well-endowed comités d’entreprises, and the like—, and who have mostly attained middle class status (as with the working class heroes of Robert Guédiguian’s films; Guédiguian was, not surprisingly, a big supporter of Mélenchon’s candidacy). Employment in public enterprises used to be entirely protected from layoffs but such is no longer the case, or looks like it will no longer be so, with the juridical transformation of a number of them—including big ones such as EDF, GDF, and La Poste—into sociétés anonymes governed by the Code du travail, i.e. with the same juridical status as the private sector. The state may remain the sole or majority shareholder but juridically speaking the way is paved for an eventual privatization in the future. The employment of a large and ever-increasing number of contractuels in La Poste is a sign of things to come. These erstwhile insiders with their tenured employment are feeling precarious, with their special pension regimes and other acquired rights dans le collimateur, and are fighting to maintain their status and privileges. 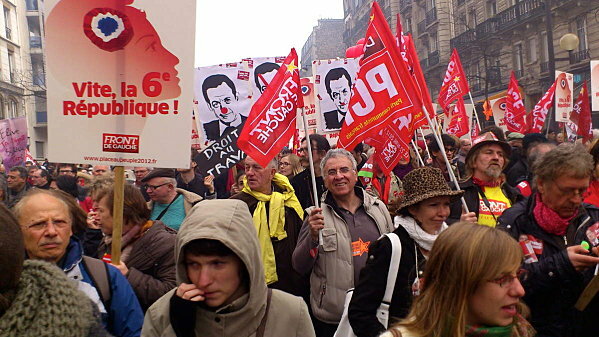 They are the Front de Gauche’s core constituency—thus Mélenchon’s pledge, entre autres, to titularisé the tens of thousands of contractuels at La Poste—and were out in force in the march on the Bastille on March 18th. The point here is that Mélenchon’s base is conservative, not revolutionary—in that it seeks to conserve something, to make sure that things do not change—, but also that it has little to do with the larger swath of the couches populaires who are truly in a precarious situation. The kinds of lower class voters attracted to Marine Le Pen’s siren song are not the same as those who voted for Mélenchon. It was salutary that the latter made a pitch for workers tempted by the FN but it was not likely to bear fruit. Mélenchon may have had a populist rhetoric but he was fundamentally an institutional candidate and with an institutional base of economic insiders. Those on the outs were not going to go for that. In this respect, it may be noted that those who voted for Arlette Laguiller and Olivier Besancenot in past elections—and particularly the former—did not transfer as a bloc to Mélenchon. A certain number of them may well have voted for Marine (as an anti-system vote of outsiders). BTW, I’ve been outre-Atlantique since Monday and while I’m following the French campaign as closely as possible on the net, I haven’t been able to tend as much to the blog. And when it comes to Sarko and Hollande, NPR doesn’t have the same level of coverage as France Inter. Things will be back to normal toward the middle of next week. according to Aaron David Miller, who says Obama “already has this one in the bag.” Inshallah. His chances are better than Sarkozy’s in ten days time, that’s for sure. Bon courage, monsieur le futur président ! La campagne du premier tour n’a pas vraiment abordé les deux sujets les plus importants : la crise de la dette publique et le chômage. Sans aucun doute, il en ira de même pour la campagne du second tour. Mais François Hollande, dont la victoire semble assurée, va devoir méditer très précisément ce qu’il dit et, surtout ce qu’il va faire. Un petit tour des questions économiques critiques. Read the whole thing here. Wyplosz’s recommendations are resolutely social-libéral. I’m pretty sure he’s on the right track. Assuming Hollande is indeed elected on May 6th—a reasonably safe assumption, though accidents can always happen—he’ll need all the help from the center he can get. And maybe even from the moderate right, in the event of a UMP crackup (a possibility I will speculate upon later). 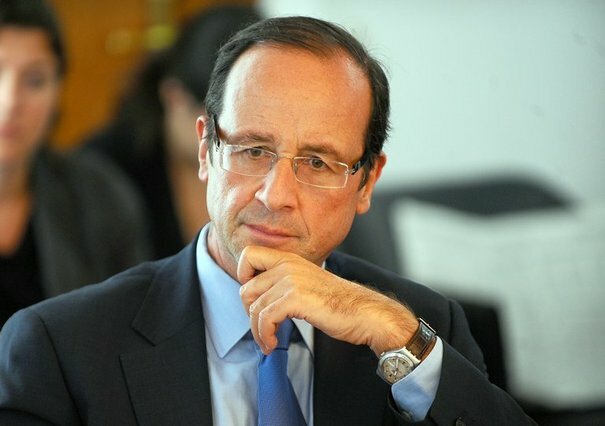 Hollande has said that there will be no ouverture such as Mitterrand’s after the 1988 legislative election, but, as we know, les promesses n’engagent que ceux qui y croient. Mélenchon’s lower-than-expected score will turn out to have been a godsend. À suivre.